Colour pencil on paper. 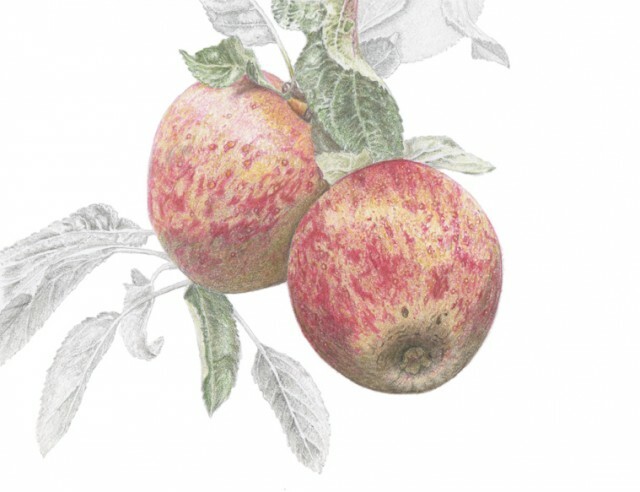 Part of a set of 16 drawings of apples from Wisley RHS orchard. Most Russetted apples are green - or that's what people expect. This one however is a lush pinky red with a heavy russetting all over, but particularly on parts of the apple that haven't felt the sun so much, the base and areas under leaves. The spear-shaped leaves themselves are on elegant long stalks and complement the less usual conical shape of the fruits.